Maybe it wasn’t Willis Reed walking gingerly out of the tunnel onto the floor of Madison Square Garden for Game 7 of the 1970 NBA Finals against the Lakers, but within the peculiar confines of high school wrestling, it was pretty close. Peter Davis/Special to the Pahrump Valley Times Pahrump Valley senior Dylan Grossell battles Western freshman Jesus Perez at 152 pounds on Wednesday night in Pahrump. Grossell recorded a second-period pin as the Trojans rallied for a 42-35 victory. 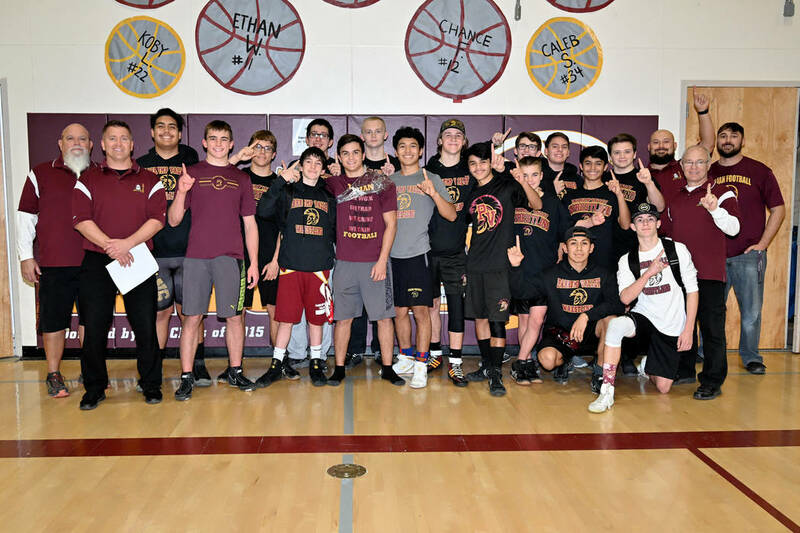 Peter Davis/Special to the Pahrump Valley Times Pahrump Valley High School wrestlers and coaches celebrate their second consecutive Sunset League championship on Wednesday night in Pahrump. 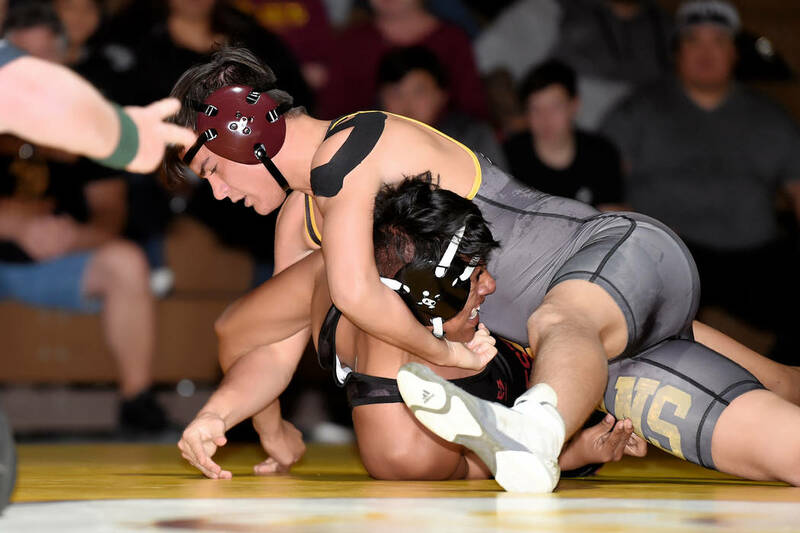 Pahrump Valley senior Dylan Grossell had missed most of the wrestling season with a greater tuberosity of the humerus fractuire, originally thought to be a deep bruise. He came back for a dual meet and clearly wasn’t himself in a 6-2 loss to Mojave junior Treyton Keller. He then sat out the Chaparral Invitational and figured to skip the Class 3A Southern Regional Championships next weekend at Moapa Valley. So when the notion of hitting the mat Wednesday night when the Trojans faced Western with the Sunset League title on the line, Grossell was hesitant, to say the least. But it was Senior Night, with a league title on the line, and they got to him. That’s the same mentality that had him playing through the original shoulder injury during football season, and he wound up being named the team’s defensive Most Valuable Player. Still, it wasn’t an easy call. A Pahrump Valley win Wednesday night against Western meant a second consecutive league championship, while a loss would have created a three-way tie that even coach Craig Rieger was unsure how it would be broken. On top of that, the Warriors are very strong in the lower weights, and it seemed likely the Trojans would need every possible point from the rest of the lineup to come away with the win. Under the circumstances, Rieger could not have been that surprised when Grossell approached him about being in the lineup. But while Reed’s impact on that iconic Game 7 was mostly inspirational — he only had 4 points and 3 rebounds while Walt Frazier’s 36 points and 19 assists led the Knicks to the title — the Trojans needed Grossell to win, and, most likely, do better than a decision. By the time his 152-pound bout came around, the Warriors had a commanding 29-6 lead, with their match-opening win streak stopped the bout before by Isaak Cruz’s pin at 145. So, wearing a small brace on his shoulder, Grossell took on Western’s Jesus Perez at 152 pounds and dominated the first period, getting a takedown early and remaining in control throughout, getting near fall points as time expired to take a 5-0 lead. Less than a minute into the third period, it was over. The Trojans had their second victory of the night, and with four forfeits in their favor still to come, the path to victory was cleared. Interestingly, the team’s younger Dylan, dominant sophomore Dylan Wright, was also ready to go despite dislocating his shoulder the previous Friday night at the Chaparral Invitational. Wright, who is technically 26-2 but undefeated before the injury, had his shoulder wrapped but was ready to go if needed. But the call didn’t come because of the Western forfeits at 160, 182, 220 and 285. Rieger moved Maughan from 160 to 170 so he would have a match on Senior Night, leaving Wright at 182. He accepted the forfeit, and while Western recorded a pin at 195 to take a 35-30 lead, the two forfeits up top guaranteed a Trojan victory and another league championship. While the most glaring number that jumps out of the scorebook from Wednesday night is the 24 points won by Pahrump Valley on forfeits, Rieger has been in those shoes before. Quite recently, in fact. “In December, when we go to these dual tournaments, we’re going there and we’re having three and four forfeits, and we’re winning close matches against the bigger schools in Vegas,” he recalled. But the Trojans have overcome the lineup issues, largely on the strength of their ability to get six quick points from several places in the lineup. The Trojans had holes in Wednesday night’s lineup, but some new faces got a chance to wrestle a varsity match. One of those freshmen took the mat for the first time in the night’s first bout. Other less familiar names on the varsity mat Wednesday night included Chris Vega, who came out at 120, and Bodhi Ledford, who wrestled at 195. Had two of those Pahrump Valley pins been regular decisions, the margin of victory would have been one point. And that one point can be laid directly at the feet of Western’s coaching staff. The conference did little to satisfy the coach, who continued the conversation when he went back to Western’s bench. The referee lost his patience and issued a warning. That didn’t stop the chatter, and the referee soon was telling the scorer’s table that Western was penalized one team point for coach’s misconduct. A similar situation happened the night before during a girls basketball game between Mojave and Pahrump Valley, when a Mojave assistant kept badgering an official. Twice the official told him, “Enough, coach,” but that didn’t do much good. When the coach barked “Seven to three,” which was the total number of fouls on each team at that point, he was hit with a technical foul. Petty, childish and a bad example, but all it meant was two free throws in a game the Trojans already had well in hand. But during the wrestling match, it meant a team point. So go back to thinking about the Trojans’ three pins and if two of them had been regular decisions. Put the penalty point back on and the match is tied at 36-36. I looked up criteria for settling ties, but the principle involved is more important than what actually would have happened. A Western victory would have denied Pahrump Valley first place outright in the Sunset League, instead forcing a three-way tie. (I’m not even going to look up how that gets settled, if in fact that information is even available. Hey, I’m only one man.) But suppose, just suppose, that would have gone Western’s way. That would have meant a coach’s insistent on belaboring a settled point was the difference between a team winning a league title and settling for Miss Congeniality. (Well, I guess he punted that, too.) Whether it’s his own team or the other team, that should never happen. If a coach is going to cost his or her team a game, do it the old-fashioned way with some silly strategic move. It doesn’t often get noticed — especially when your team wins only three of 10 contested bouts — but sometimes simply avoiding a pin is worth its weight in gold. Enter Coby Tillery and Spencer Lane. When Tillery took the mat at 126, not only had Western taken an 18-0 lead, but none of the first three Pahrump Valley wrestlers even had managed a single point before losing by fall. Momentum threatened to sweep the Trojans out of their own gym before their strength in the middle could show. But Tillery hung on. The freshman didn’t break into the scoring column until the third period of his bout with Western senior Kevin Jaimes, finally getting a point because of the first of the aforementioned illegal hold calls. But he hung tough throughout the match, not allowing any near fall points despite being taken down in each of the first two periods and dropping a 6-3 decision. After Western recorded its fourth pin at 132, Lane came out at 138 to face Dedrick Smith. Lane got an early takedown and was even at 2-2 after the first period. Smith recorded a takedown just 11 seconds into the second, but nothing came out of it and the lead was 4-2 after two. Lane started on top in the third, and it took almost 50 seconds for Smith to free himself, earning two points on a reversal. Then the lights went out. Well, actually it was the scoreboard, but the effect was the same. Lane and Smith kept on wrestling for several seconds with no clock ticking. Eventually, they called a halt to the proceedings until they could get the scoreboard back on with Smith leading 6-2. In any event, that’s the way it ended. Western led 29-0, which would not be enough to withstand the combination of pin-happy Trojan seniors and four forfeited weight classes. Had Tillery and Lane found themselves on their backs, the lead would have been enough for the Warriors to survive. You know, aside from that whole unsportsmanlike thing. Rieger knew going in how good the Warriors were in the lower weights, and he also knew they would be forfeiting four bouts. So the match pretty much played out the way he thought it would when he sat at the Chaparral Invitational watching Western wrestlers and hypothetically scoring the Trojans-Warriors matchup in his head. Yet, the Warriors’ lower weights still managed to put on a show. Rieger will get the chance to see if they get better, too, as Western’s lineup Wednesday night included three freshmen, four sophomores, two juniors and only one senior. With as many young wrestlers as Pahrump Valley has, this could be quite a rivalry over the next couple of years.